Progressive Balloon Dilatation Catheter provides consistent performance for balloon endoscopy with optimal control, efficiency and performance. 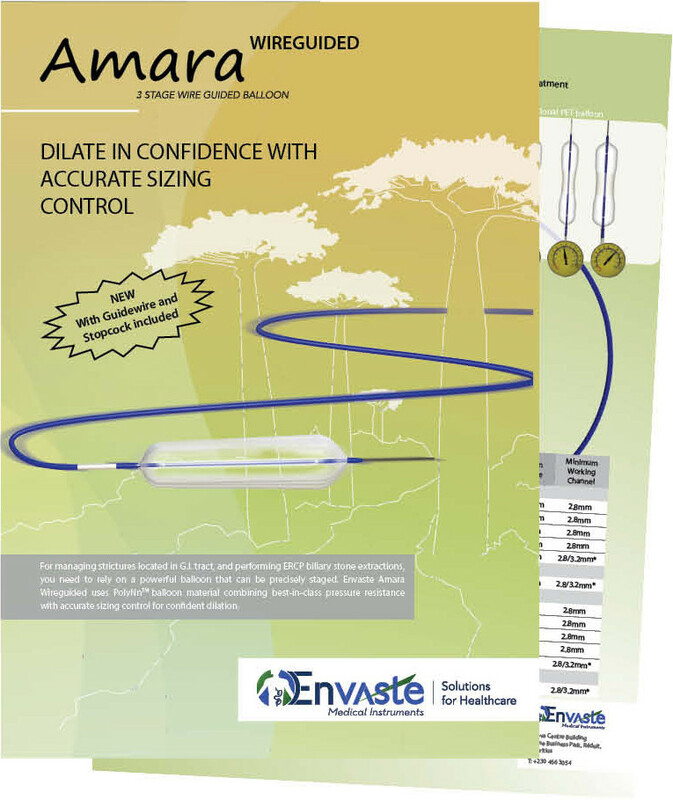 Amara Wireguided Progressive Balloon Dilatation Catheters are also indicated for use in removal of difficult biliary stones (DASE). Made with a new balloon folding process for lower profile leading to consistent ease of passage through the scope. Compatible with 2.8mm+ working channel endoscopes and 3.7mm+ working channel duodenumscopes. Smaller sizes (6-8, 8-10, 10-12, 12-15mm) are also compatible with 3.2mm working channel duodenumscopes. Embedded Radiopaque markers to faciliate balloon placement using fluoroscopy. Supplied with a 0.035" Guidewire, clamp and stopcock to faciliate procedure time. The catheter tubings are reinforced with radiopaque material designed to provide stability, strength and kink resistance even in the most challenging tortuous anatomy. Proprietary PolyNnTM balloon material and manufacturing process designed to produce three distinct and precise diameters at three separate pressures during dilatation. Supplied with standard 0.035" guidewire that can be secured to the catheter body with a clamp. Catheter shaft is design with a high column strength to offer best-in-class pushability and torque control for lesion crossing. High pressure resistance balloon designed to produce little or no balloon waisting. Low balloon crossing profile to ease insertion and crossing the tightest lesions. 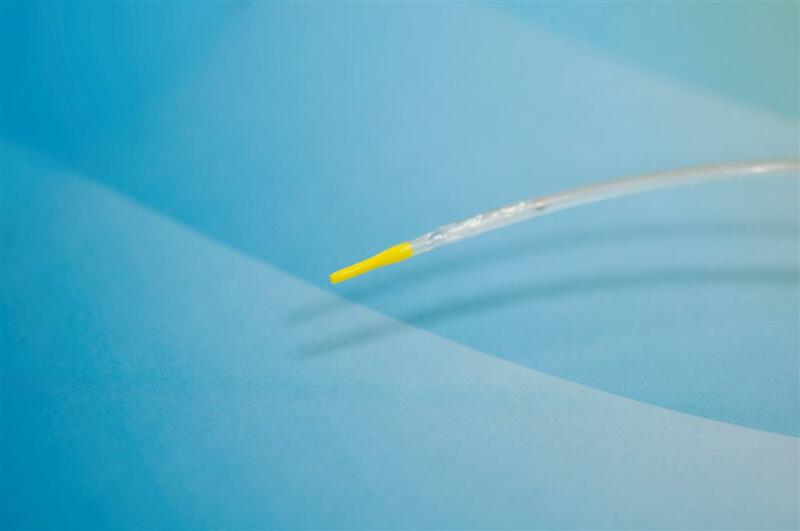 Improved catheter design with flexible tapered tip to facilitate crossability. Low balloon crossing profile with shaft to be inserted through a 2.8mm or a 3.2mm* endoscope channel. * depending on balloon size. Balloon dilatation catheter intended to be used for dilatation of strictures located in the esophagus, pylorus, duodenum, colon and the airway tree. Also available for use in ERCP biliary stone extraction and Dilatation Assisted Stone Extraction (DASE) procedures. The Amara Wireguided balloon dilatation is engineered to optimize time by combining outstanding trackability and producing three distinct precise diameters at three separate pressures during dilatation. The rounded shoulders facilitate visualization of the strictures while dilating. The high pressure balloon material is designed to produce little or no balloon waist with rapid inflation and deflation times. Amara Wireguided balloon dilatation is supplied with guidewire, stopcock and clamp.